MANILA, Philippines — Five suspected Abu Sayyaf militants accused of involvement in a deadly suicide attack at a Roman Catholic cathedral in the southern Philippines have surrendered to authorities, the national police chief said Monday amid renewed terrorism fears. Complaints for murder and attempted murder were filed against the five, as well as several other suspected Abu Sayyaf fighters who remain at large, for their alleged role in the Jan. 27 attack at Our Lady of Mount Carmel Cathedral in Sulu province's Jolo town which killed 23 people and wounded nearly 100 others. Before the bombing, the detained suspects escorted two Indonesians thought to have carried out the suicide attack around Jolo and to a meeting with an Abu Sayyaf commander, Hatib Hajan Sawadjaan, who has been accused of planning and funding the attack, police Director-General Oscar Albayalde said. Police said the five suspects were led by a suspected local militant identified as Kammah Pae, who has denied involvement. 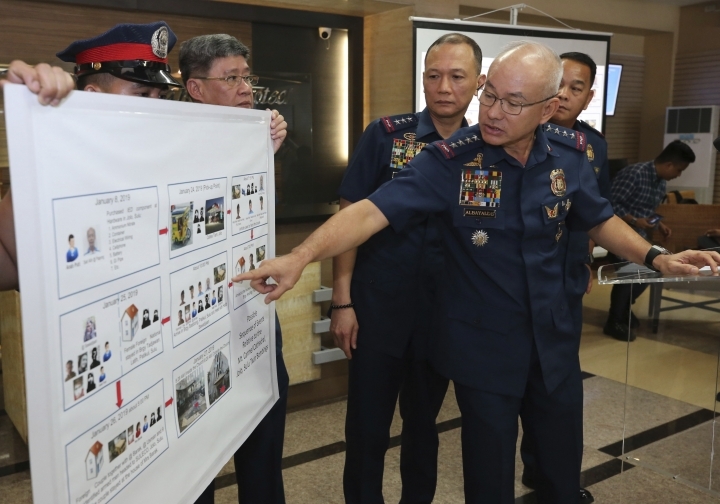 Defense Secretary Delfin Lorenzana said Pae may have known about the planned attack but was not directly involved, adding that the military will coordinate with police to sort out differences in their findings. Troops were hunting a different suspect, he said. "Although he has knowledge about the bombing ... he did not actually participate," Lorenzana told reporters, without elaborating. The attack has renewed terrorism fears across the Philippines. The national police have been placed on full alert and security has been strengthened in churches, shopping malls and other public areas. President Rodrigo Duterte has ordered troops to destroy the Abu Sayyaf, leading to a renewed military offensive in the south that has included air strikes and gunbattles. The attack has also highlighted concerns that the Islamic State group may be gaining a foothold in Southeast Asia after sustaining major battle setbacks in Syria and Iraq. Local militants aligned with the extremist group laid siege to Marawi city in the southern Philippines for five months in 2017 before they were defeated by the military. Albayalde said the Abu Sayyaf, a small but violent group based in the jungles of predominantly Muslim Jolo and outlying island provinces, staged the cathedral bombing to gain attention and possible funding from the Islamic State group. The militants also want to foment sectarian conflict between minority Muslims in the south and the country's majority Christians, he said. The Abu Sayyaf, which has about 300 to 400 armed fighters, has been blacklisted by the United States and the Philippines as a terrorist organization because of years of bombings, kidnappings and beheadings. The commander whom police have implicated in the cathedral attack, Sawadjaan, is a Muslim preacher who has been linked to ransom kidnappings and the beheadings of hostages, including two Canadian men in 2016. Citing witnesses to the bombing and statements by some of the suspects, Albayalde said Sawadjaan funded the assembly of the cathedral bombs, which most likely were detonated by an Indonesia man who had hidden in the south for about a year, and an Indonesian woman who only recently entered the south. Police said the attack was planned since last year. Albayalde said the explosives used were powerful pipe bombs, packed with ammonium nitrate, TNT and other chemicals that have been used by the Abu Sayyaf in past attacks. 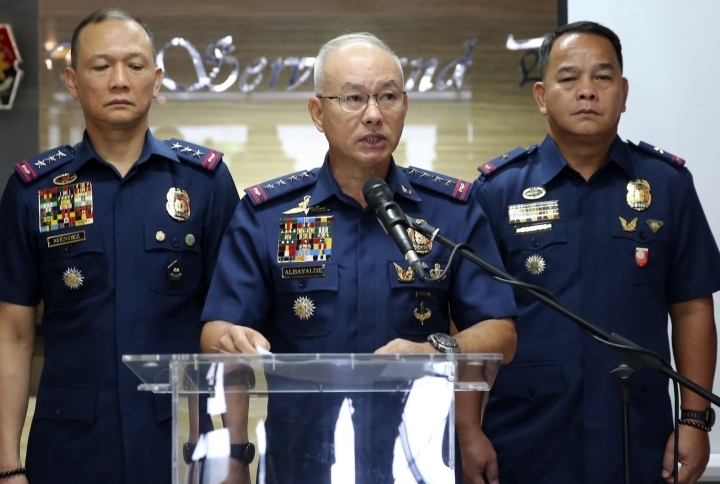 While Pae, the suspected local militant leader, has denied involvement in the bombing, the national police's chief investigator, Chief Superintendent Amador Corpus, said his surrendered companions have pointed to him as one of their accomplices and said he purchased parts for the bombs. A military officer with experience monitoring militants, however, raised doubts about some of the police accounts, including the discovery of a bomb and bomb parts in Pae's house in Patikul town, near Jolo. The officer wondered why Pae would leave such incriminating evidence in his house and then surrender to police but deny any involvement in the attack. The officer spoke on condition of anonymity because he was not authorized to discuss the sensitive case in public.